It's getting closer and closer to Christmas so it's about time for our first installment of our Christmas gift guides! In today's post, we focus on all things makeup so your loved ones will be set for the party season. This is such a brilliant stocking filler for make-up lovers of all ages and skill levels. The mix of shades is perfect for subtle everyday looks and can be built up for a more intense evening smoky eye. Considering the price these are such good quality eye shadows! Get into the Christmas spirit with these lovely fake nails from Elegant Touch. These would make lovely stocking fillers for nail polish fans who want some festive nails but don't have to go through the hassle of nail art. If you're planning on gifting a beauty subscription box, this one is full proof. The Nailbox features 3-4 polishes, plus some nail tools for all your manicure needs. With brands such as Nails Inc, Essie and Elegant Touch being regular features in the box, you won't be disappointed. A luxurious lipstick is a staple in every beauty hoarders collection, and Burberry get it just right with the Burberry Kisses range. Beautiful packaging, quality formula and a vast array of colours to chose from. I would recommend a real statement shade like Bright Plum, who doesn't love a plum lip in winter? Contouring is still huge in the beauty world but it can be a little confusing to know where to begin. This wonderful kit from Smashbox has all you need to get started, plus an amazing step by step guide on how to contour your specific face shape. Great for contouring beginners or experts. 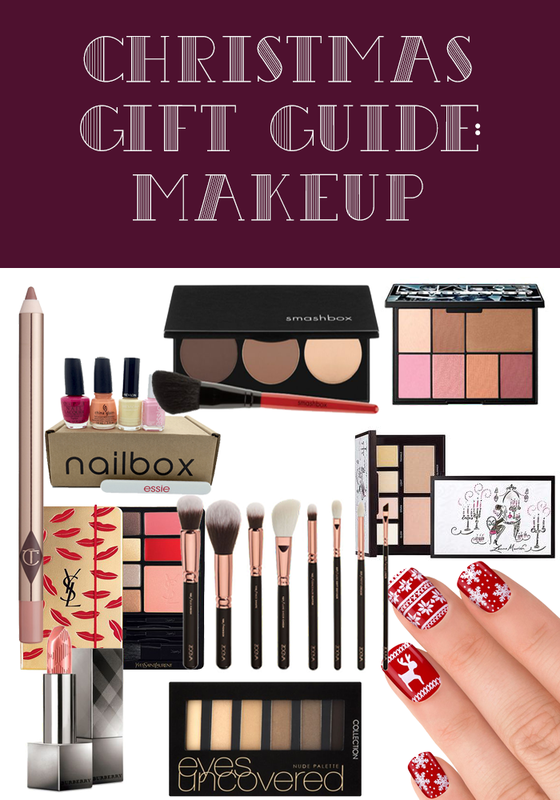 What would a Christmas gift guide be without mentioning a NARS cheek palette? This is their biggest palette yet with 4 cheek shades, 1 highlight and 2 bronzer/contouring shades. This is something every beauty lover should have in their collection, my previous versions of the palette have certainly been loved! This glow injecting palette contains two beautiful highlighters and four eye shades that all create radiant luminous skin. The powders are are so pigmented and flattering that this will last forever and the palette itself is just beautiful. There is nothing more chic than glowing radiant skin. A good quality brush can make all the difference with makeup application and this brush set has it all. Zoeva brushes are some of the best I've tried and this beautifully presented rose gold edition would make the perfect gift for someone looking to build up their brush collection. With a mix of face and eye brushes, there isn't much more you need. It doesn't get more indulgent than this! YSL's newest all in one palette offering is the perfect festive party companion it has all the right components to create gorgeous looks on the go - and can we just take a minute to appreciate how cute the packaging is? I don't think a palette as special as this is something you would necessarily buy for yourself, which is why it would make such a great gift for any make up lover. We hope you've enjoyed our first set of Christmas gift guides! Make sure you come back for the next edition: skincare.